When companies boost about how their customers love what they do, it’s worth finding out whether they are referring to their customer service or the customer experience they are providing, as there is a big difference. Customer service is the assistance and advice provided by a company to those people who buy or use its products or services. Whereas customer experience has a much broader remit. It’s the sum of all interactions (touch points) that a customer has with a company (brand) and its products and services from discovery via advertising, social media or word of mouth, right through the purchase process to continued use of those products or services. 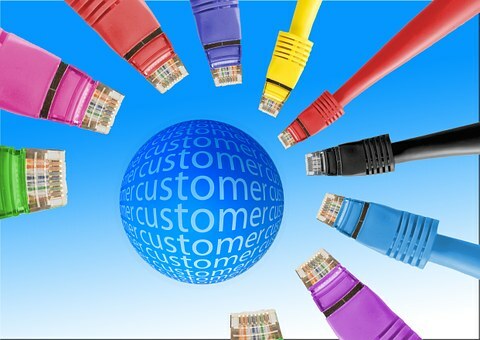 The customer experience encompasses every aspect of a business’ offering from the quality of its customer care to its reputation management, marketing, packaging, product and service features, ease of use, reliability, etc. A good customer experience means that the individual’s experience during all points of contact matches their expectations. And throughout the process, we make sure that we keep them informed, engaged, happy and in control. At Dvelop.IT everyone is involved in delivering a quality customer experience. It’s not just one person’s responsibility; we work as a team to design internal processes and systems to support our customers on every step of their journey. We want to manage their expectations, remove pain points, deliver added value and innovate everything that we do, so that our customers’ positively enjoy dealing with us. 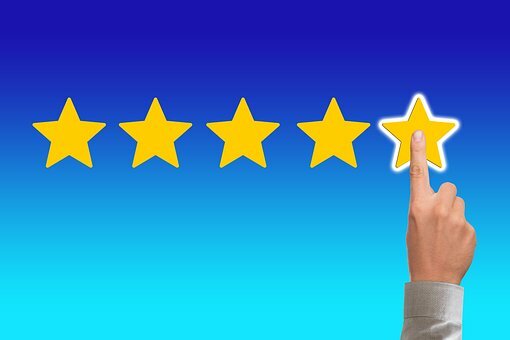 In today’s review culture, where anyone can comment online about your business, it’s important to get early feedback from your clients either via regular calls and emails or an annual customer survey. And remember it’s often the little things that customers notice and makes them question their choice of using your business, that’s why we make sure that everything we do goes above and beyond, enabling us to boost customer loyalty and enable referrals. Defining a good customer experience isn’t an expensive process; politeness, flexibility, accessibility, friendliness, open communications, personalisation, appreciation and consideration don’t actually cost anything. So next time you are wondering whether you need to enhance your customer experience so it’s meaningful and memorable, put yourself in the shoes of one of your customers and see if what you are receiving delights or disappoints you. Why referrals are the life-blood of our business! To many people, bespoke software development can be a minefield. It can seem complicated and confusing. Often when people ask us what we do, their eyes suddenly start to glaze over as we tell them how we can increase efficiencies and save them money. This is probably why, like many other successful businesses operating out there, our best source of new business is referrals from existing happy and enthusiastic clients. In the vast majority of industries, referrals are the most cost-effective way to gain new clients and grow your business. After all what better way for someone to find out about us and what we can do, than being told by a friend or colleague who has already happily experienced our service. Let’s face it; you can’t have a more motivated prospective client than one who has been sent to you by a loyal supporter. This is why we do limited marketing and focus instead on building strong and enduring long-term relationships with our clients. Their trust, belief and loyalty, combined with great feedback and the ability to pass on names of people that they know who may be interested in using our services, is worth its weight in gold. Our continuing challenge is remembering to ask our clients who they know who may benefit from using our services. Hence the fact that our email signatures now encourage referrals. And we will always thank clients privately and publically for them. In addition, on a regular basis, we make time to speak to our clients, this gives us an opportunity to find out how things are going and provide them with any further help and/or information they may need. We also try to include them in regular mailings and eshots so they can find out what we are up to and we can raise our brand awareness too. In recent months we have been focusing on areas where we can partner with other businesses that currently make use of our services. We are also using social media channels and regularly updating our website to make it easy for clients to share and refer the Dvelop.IT brand. And we welcome clients’ testimonials and even the opportunity to write case studies, so we can share real life experiences which help to make what we do easier to understand and buy into. Adding value is something that most businesses say that they do. It’s often over-used and in fact badly used. What you might regard as adding value might be something that your client expects as part and parcel of what you said you would do. So when you confidently say to clients that you add value, which we know that we do at Dvelop.IT, you must spell it out clearly, so that there is no misunderstanding. When clients feel they are getting something extra, they become really happy and more likely to tell other people about their experience, this is where you can really benefit from additional work from them, and/or referrals to other businesses that they know. Essentially when it comes to adding value, knowledge is power. We know our clients and their businesses inside out. We understand what they want to achieve, where the niggles or pain points are, as well as their strengths and weaknesses. This gives us an edge and an opportunity to go further when it comes to delivering exactly what they need, when they need it. 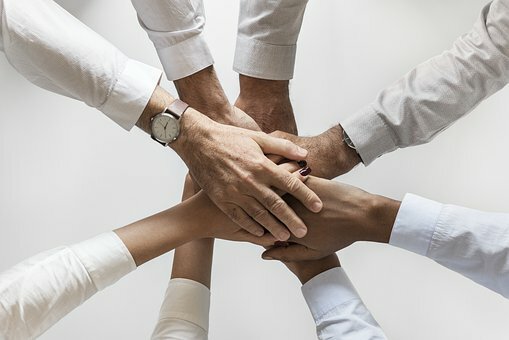 Whilst most of this is quite obvious, you need to remember that your business only exists because of your clients, so by focusing on their needs and adding value to the relationship and your service, you are not only ensuring their continued growth and profitability, but the future success of your own business as well. Don’t compromise on your software! Let’s start this blog by saying that there is nothing wrong with off the shelf software. Essentially it’s ready-made, immediately available and accessible to lots of people. 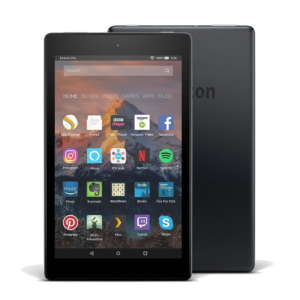 You usually pay a license fee to use it and whilst it can fit the bill in the short term, you will probably never use all its features and capabilities because it has been designed and built for generic use. On the downside, you may have to compromise, as it won’t do everything you need it to, when you need it to do so. And in some cases it may be too complicated and because you are not in complete control, you’ll find yourself unable to change or improve its functionality over time to fit with the changing needs of your business or to address certain pain points/issues that occur. But there is another way! Bespoke software is written especially for you and will meet your specific business requirements. It’s easy to use and will seamlessly integrate with other technologies that you have. Plus, because it’s flexible, it will deliver the results you want, when you want them. When you choose tailor-made software, you own the intellectual property. This means you are not tied to a specific vendor who may potentially disappear at any time, plus, once you’ve paid for it, there are no ongoing costs or extra fees to fork out for as your business grows. 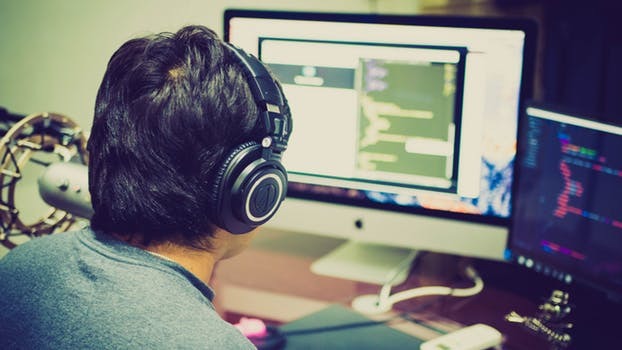 Developing bespoke software will set you apart from your competition with unique applications that are capable of improving efficiencies, performance and customer satisfaction levels, whilst at the same time helping your business to adapt and grow. And if during the development phase you want to adjust, modify, expand or improve the features without having to start from scratch, this is not a problem. 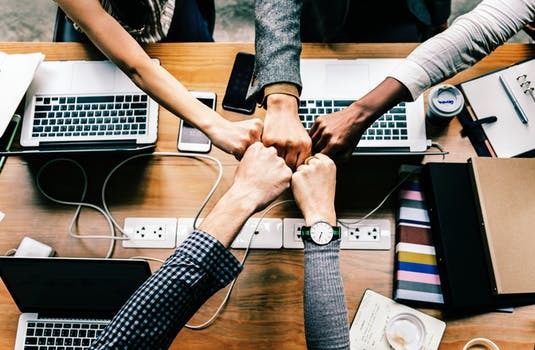 By working closely with you, we can quickly identify problem areas or issues before then designing and building bespoke software (mobile apps, web based or more traditional desktop applications) that will increase efficiencies and enable growth without significantly increasing overheads. So if you want the latest software to fit with the growing demands of your business and would like much happier customers, we could have the answers. At Dvelop.IT it’s all about the people! At Dvelop.IT we appreciate that whilst bespoke software development is necessary, for some people it’s not the most exciting thing in their world. But for us, it’s what we do and more importantly, it’s what we are really good at. We are an established business with a successful track record. Our in-house team are knowledgeable, skilled and experienced. We work collaboratively with you to comprehend what you want to achieve and the market in which you operate, before helping you to solve everything from the simplest to the most complex of business problems. Our software engineers combine passion and technical thinking to revolutionise the way your business communicates, how you process your work and ultimately how your business performs. Quality and detail are essential, so we come up with innovative ideas and then design customised software that will work the way you work. Offering a friendly, personable and knowledgeable service, our team also have the ability to speak plain English, so you don’t get lost in all the jargon and techie language. We also pride ourselves on our agility, trustworthiness, responsibility, transparency and ethical approach in all our business dealings. Our customer service skills are also impressive. We remain responsive and communicative. You will have complete visibility of the software throughout its development and can comment on it as it is being built, thanks to regularly released project updates. In addition, we will never sell you something that they don’t need. Our well-researched solutions will always deliver exactly what you want in a timely manner. Plus, once your project is complete, we offer ongoing support, consultancy and/or hosting to keep your business operating productively and profitably. So whether it’s a new app, database or ensuring all your software integrates successfully and talks to each other, we guarantee to deliver creative, easy to use and visually engaging software that is cost competitive, saves time, puts you back in control of your business and meets your current and future needs. Marketing automation – are your systems talking to each other? Where would we be in business without clever software and systems? Automation is the way forward when it comes to achieving great results, whilst saving time and money, particularly when it comes to marketing. We all know that having a customer relationships management (CRM) system is a great way to manage relationships with prospects, customers, suppliers and other business contacts. Equally a content management (CMS) system offers a flexible means for you to add, amend and/or control your website content. And let’s not forget email marketing and whatever system you use to undertake this. We are currently working on a new solution that will enable your different software’s to work seamlessly with each other. We know that by integrating these three marketing platforms, you will benefit from an even clearer overview of your customer journey from start to finish as well as experience increased conversion levels. GDPR, love it or loathe it, as a business you simply cannot bury your head in the sand and hide from it. 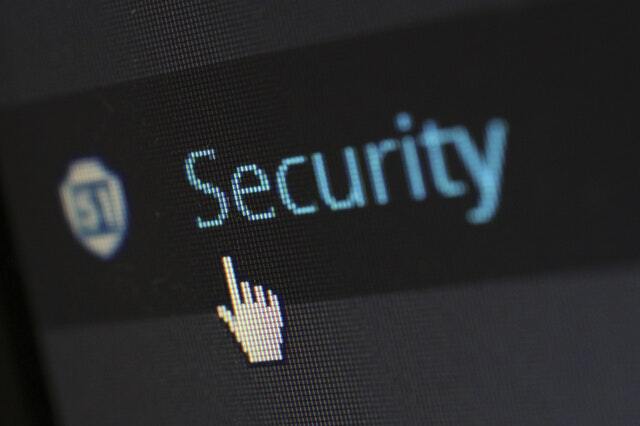 The General Data Protection Regulations (GDPR) comes into force later this week. However, unlike some organisations, we are more than ready for it. Last summer we decided that it would be a good thing when it comes to managing relationships with customers, prospective customers, suppliers and other business contacts. So instead of being scared, we have renamed GDPR as a Good Device for Progressing Relationships and have embraced it rather than fearing its connotations. We think that GDPR is a mind-set. Right from the outset, we saw it as an opportunity to grow stronger, more engaged prospect streams where we engage with everyone in a targeted manner, safe in the knowledge that they want to hear from us. Also with fewer people on our lists, we can communicate with them in a more relevant and personal way, which we believe will lead to enhanced results going forwards. This can be illustrated in a conversation I had recently with another business owners. They had a database of 4000 potential customers. It dated back decades and no one remembered why people were on the various lists and indeed who most of them were. Like many organisations they had attended events and collected business cards or trawled through Google finding businesses and individuals who they believed should want their services and simply added them to the lists. So imagine their surprise when they did their first GDPR emailing some months ago? Only 8 people said they wanted to remain on their lists. The business owner was shocked. As a customer of other businesses, I have been inundated with GDPR consent requests recently many from businesses that I don’t know. How I have ended up on their lists remains a mystery, but thanks to GDPR I will be able to free myself from the weekly/monthly emails without having to unsubscribe. This is a good thing for me and for their business too. They will be able to save time and money by only targeting people who want to hear from them – surely that’s logical? 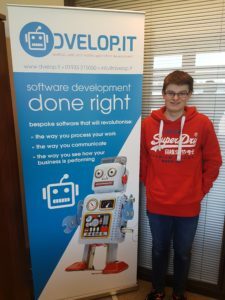 Meet our Apprentice Software Engineer! Hi! I’m Lewis and I’m 17. I have a huge passion for IT, Cycling, toy pandas, dogs and everything tech! Prior to starting this apprenticeship I was studying A Levels in: Computer Science, Engineering, Maths and an EPQ (Extended Project Qualification) in Software Development. After months of intense studying I decided that I wanted to chase my dream, be happy and most of all enjoy my daily life! On Monday 29th January 2018 that I realised that I was not truly happy. And no, I didn’t carry on with Sixth Form. Life is too short!! It wasn’t as simple as finding an apprenticeship and then working for that selected company. You have to find one that suits your individual personality. So, on that morning I googled “Find Apprenticeships”. I went through the whole list and I found one, which just happened to be in the Software Development industry. It just “felt right”. A few weeks passed and my first day at Dvelop IT came. Prior to walking into the building I was incredibly nervous, scared and timid. Was there a need? Not at all! They are the friendliest bunch of guys I have ever met. They always make a joke out of anything. But, they are always professional in their work. So far, in my 3 weeks of working for Dvelop IT I have learnt an incredible amount! I have learnt the fundamentals of C#, how to create simple GUI’s, how to create a database and understanding the best coding practises. One hurdle that I have came across is my lack of experience within the C# language. However, the team have constantly reassured me that with time and experience I will have the knowledge, confidence and experience of the language. After all, I am eager to learn! I feel like my future is looking bright! Social responsibility. In my opinion we don’t hear this enough, especially in business. It’s important in any social system to give back when you have success. Over the last couple of years Dvelop.IT has grown considerably and we’re very proud of that. Because of this we have partnered with Age UK Milton Keynes in 2018 to raise funds for a charity that’s close to our heart. Wear your Pyjamas to work day (April): We thought this might be something fun to kick things off! Everyone is going to pay to wear their PJ’s to work as well as ask our business neighbours to donate. Frankly, who doesn’t want to see a bunch of IT geeks in their nightwear? Dragon-boat festival (June): Perhaps our most challenging task for the year. 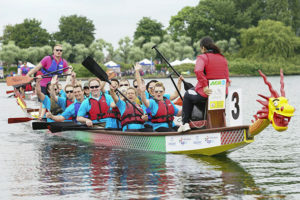 We have partnered with our client (Giantt) to enter the Milton Keynes Dragon Boat Race. We don’t hold up much hope for winning but would love to raise a decent amount of money for Age UK. Keep an eye out for our just giving page and please give generously! Christmas (December): Again, no specific plans yet, but maybe donating gifts and being involved in the memory club at Christmas might be a nice touch. We would encourage any businesses out there who want to give something back to join us. You’ll be supporting a wonderful cause, showing your clients that you care about social responsibility and let’s face it, have some fun too! We hope you will support us by donating generously and look forward to seeing what our friends and clients do in regards to social responsibility this year. Going to the Great British Business Show last November was fantastic for us. We met so many great people, many of whom have now become clients. It’s been an amazing way to speak to people face to face as well as promote what we do on a larger scale. Apps are the future! We all know this market has been growing for the last few years but right now apps are hotter than ever. It’s the latter of the two observations I wanted to write about. Historically, Dvelop.IT has specialised in making revolutionary back-end systems. These systems run businesses! They are an integral part of how our clients operate day to day and we’re very proud of what we do. This will never change, but what is changing is the popularity of apps. Long gone are the days of limited functionality and clunky user interfaces. 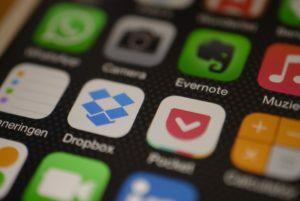 For now and for the future, apps are sleek, smart and increasingly important to businesses. They offer something different, essentially a customer focused way of connecting to your company or using your services in a more friendly and productive way. There are two types of people that come to us with requirements for apps. The first is existing businesses who want to improve communication, sales and engagement with their clients/customers. The second is ‘start-ups’ whom have a brilliant new idea they want to take to market. For us, both are equally as exciting. Showing a business how they can improve and watching that improvement gives us a great sense of satisfaction and is the reason we started Dvelop.IT seven years ago. Helping a new business get off the ground is also very rewarding and I’ll admit it, even great fun! 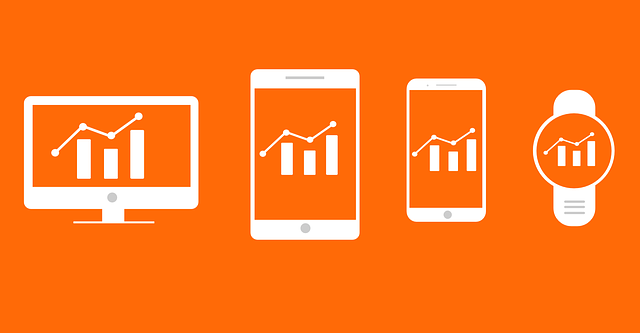 However you look at things, apps are on the increase and we love being a part of that. It still surprises me when I see large enterprises who still don’t use an app. Let’s take football clubs for an example. Manchester United (arguably the biggest club in the world) don’t even have an official app! I know, I was shocked too. Think of all the ticket and shirt sales that are missed, all the opportunities to share official news and transfer updates and most importantly the connection with the fans that’s not being utilised.